Select the countries you would like to have the speedcams from. Press after this on the button "download". and select "Extract all Files" (this is only possible on Windows XP or higher, For other systems to extract the files you can user the program winzip or the free program 7-Zip). Press next to go to the next step in the wizard. In our example we use the standard Windowx XP unzipper. 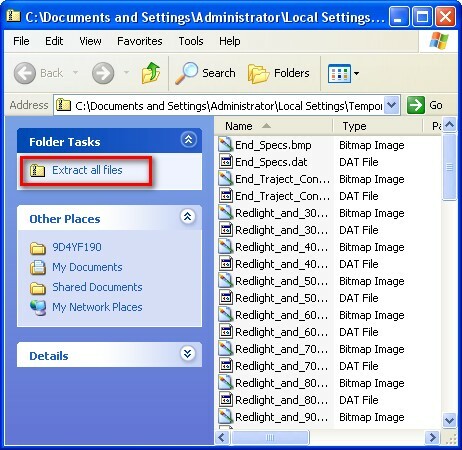 Select the folder to extract to. In this case d:\DestinatorPOI and press Next. The files are extracted press next to show them. Copy the extracted files that contain the speedcam data. Make sure the pocketPC device is connected so that you can install this on your device. Now it is time to setup the Destinator Application so that we will be warned for speedcams. Go to My Favorites and select all the speedcam groups you would like to display. Press the group and after this the Alerts button to set/adjust the warning distances. Repeat this for every group you would like to be warned for. Here you can see the speedcams on the map.